Asterdam's numerous canals make it the Venice of the North, but all of Nederland is filled with waterways. rail journey in this low-lying country – where 20% of the land is below sea level – crosses countless bridges. Spend too much time admiring the beauty and you'll spend your money in bridge tolls! This beautiful map includes an ingenious new twist. On the many double-track bridge crossings, grab the first route and pay a price in Bridge Toll Tokens to the bank; claim the second route and the tokens go to the player who claimed the first route! Score bonus points based on the total value of Bridge Toll Tokens you own at game's end. 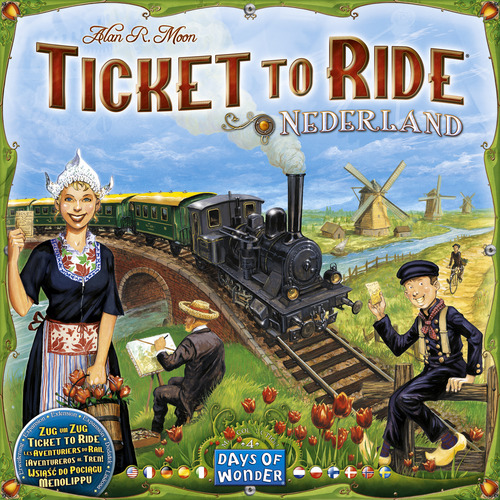 This is not a stand-alone game you will need either Ticket to Ride or Ticket to Ride : Europe in order to play.